Th-INK-ing of You: Aug. Release Blog Hop! Hello friends! Welcome to the Our Daily Bread designs August Release Blog Hop! I'm so excited about this month's release! I have already made some bookmarks that have been given away, and I know I will be making many more! I hope you enjoy this hop, which by the way is FULL of inspiration from our talented design team! I am the first stop on the hop, so you can just follow my link to the next person, but if for any reason you get lost along the way, just pop on over to the Our Daily Bread designs Blog for the complete list of links! Check back at the ODBD Blog on Aug. 3 to see if YOU are one of the winners! You never know what other fun things we might have for you that day!!! I used the Faith, Hope, Love set and the Vine Background. I created a center step like I've shared before but adjusted my outer panels to accommodate the width of my panels. I matted with black and added a Spellbinders Ironworks Accents border. I cut the Love panel with Spellbinders Long Classic Rectangles Large, and the Long Scalloped Rectangles Lg to mat it. The ribbon is May Arts and the flower is Spare Parts. The pearls are from ACMoore. I love the elegant font of this set! I could see this not only as bookmarks but wall art, notebook or journal covers, or for an elegant home decor piece. Wouldn't the Love word make a gorgeous wedding or anniversary card? Oh the possibilities! LOL! Thanks so much for stopping by, and I hope you enjoyed my card! From here, you'll hop to the amazing Becca to me blown away! I Love this card - black and white are so elegant!! This is beautiful Grace! Love the black and white and then that splash of red. What an elegant and beautiful center step card Grace!! I just love the black and white with the pop of red and how you incorporated the background!! Gorgeous as always my friend!! so pretty in the black and white Gtrace - love the center step design of your card! Where do I start....love the stamps, the design, and the color choice. You get a big A+ on this beauty. You have done a great job. It is a beautiful card. Beautiful. I just saw the Aug. release and was wondering if I really needed so many things to make a bookmark - glad to see your usage. Wow how Elegant. Love the layering. thanks for sharing and for the chance to win. Love all the new stamps. Grace, I love your card and the sentiment is my favorite. Wow Grace this is Gorgeous!!! Love the black and white theme:) Awesome!!!! This is absolutely stunning, Grace! I love the center step design and the elegant black and white with a pop of red! This is beautiful Grace. I love the way you made the center step card so you can show all three stamps in the set, as well as one background on one project. This set is just beautiful, as is your card. The set would be a lovely and versatile set for anyone, as it can be used in so many ways, not just as a bookmark! Gorgeous card! Black & white is so stunning! I love step cards and this one is awesome! Black and white are so striking and that touch of red just sets them off. Love those stamp sets too. Must haves. Elegant! I love using black and white with a color accent! The red bow adds a "pop" of color and draws one's attention to the words above it. I can imagine many uses for this stamp. On to my Wish List it goes! Nothing more elegant than black and white. Awesome card ~ would be great heat embossed! I love the Faith Hope Love. This is the first time I've been to your blog but I will be coming back. Thanks for the inspiration. Very nice card. Love the stairstep cards. Great job. So lovely! I have a very special friend in mind to make this wonderful card for so I can't wait to order the new stamps! Very nice Grace. Great idea and love the colors. Thanks for sharing. Actually, this card would be a great wedding card just as it is. Beautiful. This card is stunning! This set would look beatiful in words spelled out in a frame for home decor. Wow! That card is goreous! Gorgeous! I love the lettering used for faith, hope, and love. You have used a timeless and elegant color scheme to set off the new stamps. Thank you for sharing! This card is stunning and I love the entire set. It touches my heart. I love black and white combo with touch of red, so elegant and this card is just gorgeous. Love that font. So Lovely and just perfect for a step card!! Love your take on this hop. I've already had to put my order in for these stamps. So beautiful and so many uses, as you said. Can't wait for them to come, but know it will be fast, as their shipping is amazing. Thanks for the beautiful idea. As I was looking over the new release post on the blog I was thinking about how many other ways you could use these sentiments besides on bookmarks. Thanks for posting a fabulous example of this, it's positively gorgeous! Love love love this stunning card with that splash of red!!! So elegant and beautiful Grace! I have always loved "black & white" and you did a beautiful job on this card!! Beautiful card and so elegant. Grace, I just love this card. It would be a blessing to anyone you send it to. Pure elegance! What a beautiful card for someone to have on display in their home. BEAUTIFUL SET TO GIVE AS A GIFT. Grace, this is a beautiful card. An elegant black and white card just stunning. This is so amazing! The black & white is such a great BG for the designs you chose & love the "touch" of red. Thank you for sharing your design with us. Absolutely stunning Grace!! I love the colors and your gorgeous design! Beautiful Grace! Black and white design soooooo elegant. Love how it appears dimentional. Two great sets making one great card. Love the black and whithe with that splash of red. Beautiful. Your step card is. Very encouraging. Thank you! Love your black and white step card. Amazing! Black is one of the colours I use so much! lOVE THE STEP CARD! Your card is stunning, this is a beautiful stamp set and I love how you used it as wekk as the colors you used. So beautiful Grace! Love the way you used this set to create this stunner. Beautiful, Grace! And so elegant and stately in black and white. The bloom and bow are the perfect touch! Grace, this is a beautiful card and perfect for many occasions. Wow Grace...You did a fantastic beautiful job...AWESOME!! love it!! I love this done in black. It is so elegant. Oh what a beautiful card! I am so attached to black & white all of a sudden, so you know I LOVE this card. I must have that set, so much meaning! I love looking at the creative works of others. Beautiful! WOW factor on this card, it's beautiful, very impressive! Love the way you've used the words. Grace, this is so striking! I love black, white and red together! Beautiful! So striking! LOVE the pop of red! Very beautiful!! Love the way you used the words on a step card! Thanks for sharing your creativity! I love black and white with a touch of red-- this is just beautiful!!! Beautiful tags; the black and white is so elegant! oh, Grace! stunning!! it's just beautiful!!! Love the new stamps...so much detail. They look great in black and white! Beautiful! LOve how you kept it all in black and white. What a beautiful card Grace.. Very pretty and elegant, Grace! Grace, I don't know how you ladies always post on the blogs. I do love this card, but I would not love sending it away. I love the shape of your card and the way you have used the background stamp and the others. Black, white and Red make such elegant cards. well done. This stamp set is so perfect for this fold. I love the black and white, the fold, the flowers, everything. Thanks for sharing. This is a beautiful set! I love the way you used it and besides being one of my favorites, black and white is so elegant. hi Grace!! What a classically elegant beauty of a card...I love this font and hope to see it used more ways!! Perfect use of this fold, too! WOW - love everything about this card. 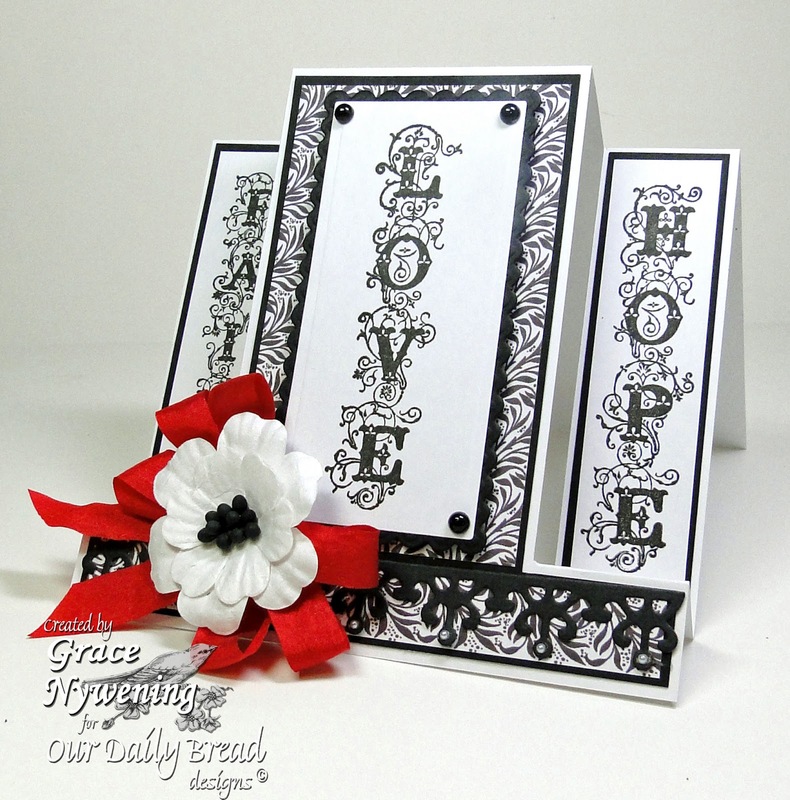 Elegant center step card design Grace ... love the splash of red on the black and white ... tfs. That is an absolutely beautiful card, love it. I just loved the black and white. This is a lovely design! I'm not usually partial to black & white but this is just elegant! I can definitely see this as a card. This card is stunning. Very elegant. Love the pop of red. Your card is stunning. Absolutely gorgeous. Love it. So elegant - so thoughtful. Love the touch of red against the black and white. Thanks for sharing your creation! Very elegant! Thanks for the idea! Stunning work and the design is so appealing. Thanks for sharing. Beautiful card...love the font used, the B&W and the sweet words. Beautiful projects! Love this new release...thanks for the chance to win some candy! I love how you put this card together, it is so elegant! Stunning card! These 2 sets offer so many possibilities! Very elegant and I like the pop of red. Grace, I love your style and the black and white are just so elegant. Wonderful. Beautiful card design. Another wonderful ODBD release! Your card is gorgeous and I love the new stamps. Grace, your card is so elegant!!! The black and white combo is perfect for this set. Love how "love" stands out from the rest.. after all it is the greatest of these :). How stunning! And so beautiful...black and white is just perfect for your card, and the touch of red really makes it pop! Grace: This card is so lovely. I love the black and white with a touch of red. These two stamp sets are a must have. Thank you for sharing your talents. This is absolutely gorgeous, a work of art! Thanks for sharing your creativity with us. Absolutely Stunning!!!! Black & White cards with a pop of color are so elegant and amazing. Love this set. Thanks for sharing. Wow, what a gorgeous card. Love the font on the words. Black & White is a great color combo and the pop of read is perfect. Oh my goodness! I love black and white for sure, but the pop of the red bow and white flower just make it divine! I love this set and your card. Thanks for the chance to win! Hugs! WOW!! What a beautiful card!! love those stamps!! Grace, what a clever use of the bookmarks!! Love the card and the punch that the black and white gives! Beautiful! This is stunning Grace!! LOVE how you showcased the sentiments with the stair step design!! I Just love your card! The stamp sets you've used are just wonderful. I love your card. I bet your bookmarks were beatuiful, too. TFS. Stunning is all I can say Grace - this is absolutely stunning. Love it. This is such a stuning card. It is just beautiful. You make it look so easy. Great job. Lovely card, I like the red/white flowers and ribbon. Love, love, love!! So elegant and clean, the step design is beautiful with this stamp set. Thanks for sharing with us. This is fabulous Grace! Love the elegant choice of black and white. That pop of red just makes it shine! So regal! Thanks so much for sharing your heart. this is seriously gorgeous, grace!! i love the black and white combo with that pop of color from the flower... stunning! Love the crisp elegant look of the black and white! Just gorgeous, Grace! I am so excited about this month's blog-hop. I have wanted a book-mark die-cut and room to put Scripture on it for a long time! Your project is fabulous...and I didn't realize that all three words came in one set...I just didn't notice. That is wonderful. I love the layout you chose and the pop of red is really exceptional. I just love this Grace--beautiful! Your creation is absolutely gorgeous! I agree there are lots of possibilities with this set. Really like how you used the bookmark concept. Absolutely breathtaking! Such an elegant showcase for these powerful words. Great job! Absolutely breathtaking! Such a beautiful showcase for these powerful words. Great job!